As US Real Wages and Salaries slowly rebuild, investors and policy-makers look for causes to the slow growth. Real Wages and Salares is often a more helpful of job health than un/underemployment counts because real wages and salaries is personal. It’s about paychecks and money circulating in the economy. Real Wages and Salaries depends on inflation, hours worked and hourly earnings. While domestic causes are important, global causes are increasingly important. 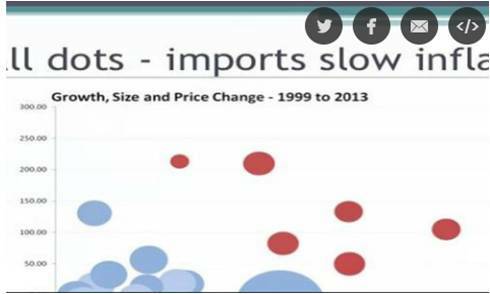 In looking to imports, 6 dots — red dots on the chart in this NYFP video are categories that are growing fastest and largest in size. Not surprisingly, other than petroleum, they have the slowest price growth. Because of this importance, starting June 2014 the US Bureau of Economic Analysis will release this data with a new level of detail.